First make the crust. Put the flour, sugar, cocoa and salt in the bowl of a food processor. Pulse a few times to combine. Break up the shortening and butter into smaller pieces and drop into the bowl. Pulse maybe 10 times more until the mixture is crumbly and the butter and shortening are well distributed. While the machine is running, drizzle in the ice water, and stop just when the dough comes together. Stop the machine and feel the dough, if it comes together when pressed between your fingers, it's ready. Turn the dough out on a lightly floured surface and bring together with your hands into a flat disk. Wrap in plastic and refrigerate for 30 minutes. Roll the dough out on a floured (in this case I used more cocoa) surface. Fit the dough into your 9" pie pan and trim the edges. Put the crust back in the refrigerator while you prepare the filling. For the filling, whisk together the bourbon and the cornstarch in a mixing bowl. Whisk in the eggs, and then the corn syrup and sugar. Chop enough of the pecans to make 1 cup. Stir in the melted butter and the chopped pecans. Take the pie crust out of the fridge and cover the bottom with the chocolate chips. Pour the filling over the chips. 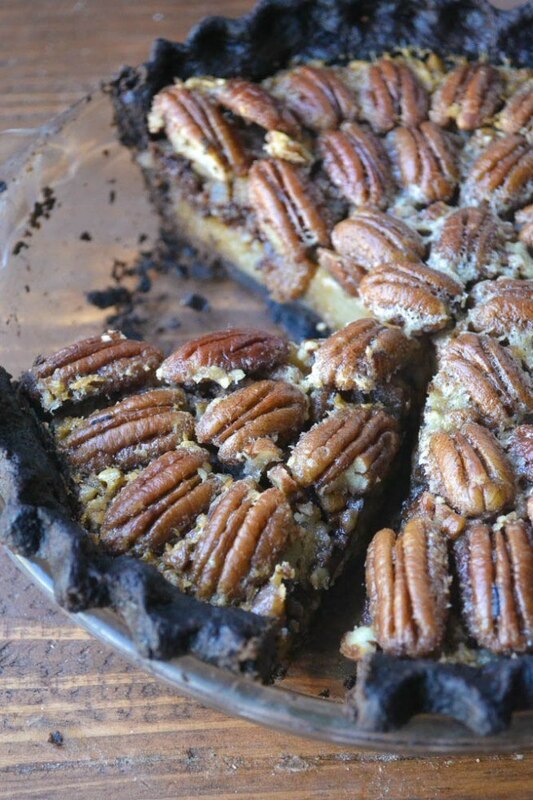 Arrange the remaining pecan halves over the entire top of the pie. Bake for about an hour until bubbling and puffed on top. TIP: I usually lay a piece of foil loosely over the top to prevent too much browning...I think the pecans look better when they aren't dark brown. Let the pie cool on a rack before cutting.